From now we offer a new adapter block for „AB gene 96-well Storage Plate, round well, 0.8 ml“ for the BioShake mixers. 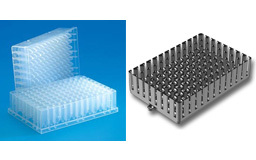 These plates are used in molecular biology for storage of samples as well for assay set-up. Numerous customers are using these plates in the course of NGS for library preparation with “TrueSeq Kits” of Illumina. Also sample preparation for Illumina “Nextera Rapid Capture Enrichment Kits” is processed in these plates. Plates are called “MIDI Plate” and they are shaked with a frequency of 1,800 rpm. In contrast to most homogenizers available in the market, the SpeedMill PLUS homogenizes samples by vertical movement but not by rotation. With this technique the input power is converted into disrupted forces highly efficiently. Therefore, only little heat is generated. Powerful handheld laboratory mixer LabMix Mini 201 is designed for mixing and homogenizing of different samples in standard laboratory tubes. Mixing and incubation or cooling are essential steps of molecularbiological techniques. This unit is shaking your samples efficient with an orbit of 3mm and keeps temperature in a wide range from 4 to 99°C. The microprocessor controlled electronic and high quality peltiers guarantees temperature accuracy and - constanty. Thermomixer is easy to use by 9 programms with 9 steps each. 4 easy interchangable blocks ensure for necessary flexibility during the daily work in the lab. 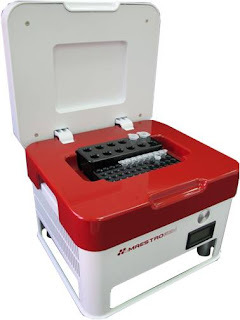 This economical microprocessor controlled dry block heat bath can run either two tube-blocks or one microtiter block. The digital LCD readout monitors the temperature in REAL-TIME and displays the target temperature. The heating range goes from 5 °C over room- temperature to 150°C at a temperature stability of +/-0,2°C.